Robert Post is a Sterling Professor of Law at Yale Law School. Post’s subject areas are constitutional law, First Amendment, legal history, and equal protection. Robert Post is Sterling Professor of Law at Yale Law School. He served as the School's 16th dean from 2009 until 2017. Before coming to Yale, he taught at the University of California at Berkeley School of Law. Post specializes in constitutional law, with a particular emphasis on the First Amendment. He is also a legal historian who is currently writing Volume X of the Oliver Wendell Holmes Devise History of the Supreme Court of the United States, which will cover the period 1921-30 when William Howard Taft was Chief Justice. Post has written and edited numerous books, including Citizens Divided: A Constitutional Theory of Campaign Finance Reform (2014), which was originally delivered as the Tanner Lectures at Harvard in 2013; Democracy, Expertise, Academic Freedom: A First Amendment Jurisprudence for the Modern State (2012), which was originally delivered as the Rosenthal Lectures at Northwestern University; For the Common Good: Principles of American Academic Freedom (with Matthew M. Finkin, 2009), which has become the standard reference for the meaning of academic freedom in the United States; and Prejudicial Appearances: The Logic of American Antidiscrimination Law (2001), which was original delivered as the Brennan Lectures at Berkeley. Post publishes regularly in legal journals and other publications; exemplary articles and chapters include “Data Privacy and Dignitary Privacy: Google Spain, The Right to be Forgotten, and the Construction of the Public Sphere” (Duke Law Journal, 2018); “The Politics of Religion: Democracy and the Conscience Wars,” in The Conscience Wars: Rethinking the Balance Between Religion, Identity, and Equality (Susanna Mancini and Michel Rosenfeld, eds., Cambridge University Press 2018); “Theorizing Disagreement: Reconceiving the Relationship Between Law and Politics” (California Law Review, 2010); “Roe Rage: Democratic Constitutionalism and Backlash” (with Reva Siegel, Harvard Civil-Rights Civil-Liberties Law Review, 2007); “Federalism, Positive Law, and the Emergence of the American Administrative State: Prohibition in the Taft Court Era” (William & Mary Law Review, 2006); “Foreword: Fashioning the Legal Constitution: Culture, Courts, and Law” (Harvard Law Review, 2003); and “Subsidized Speech” (Yale Law Journal, 1996). Post is a member of the American Law Institute and a fellow of both the American Philosophical Society and the American Academy of Arts and Sciences. 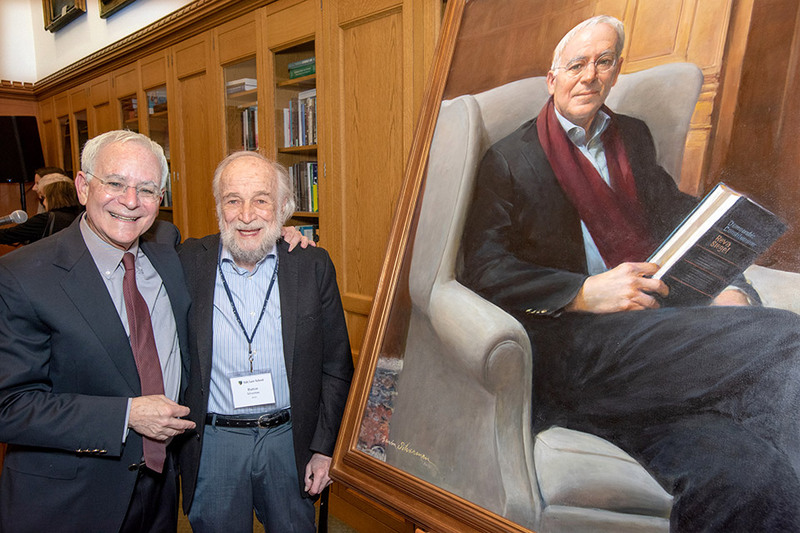 The unveiling of the official portrait of former Dean Robert Post '77 was a celebration of the Sterling Professor of Law's career. Sterling Professor of Law Robert Post ’77 is mentioned in a piece by Noah Feldman ’97 about free speech on college campuses. The American Law Institute (ALI) announced that Sterling Professor of Law Robert C. Post ’77 has been named a Co-Reporter for its ongoing Restatement (Third) of Torts: Defamation and Privacy. Sterling Professor of Law Robert Post ’77 is quoted in the New York Times about a stage play based on Ricci v. DeStefano. Judge Barrington D. Parker ’69 L.L.B., Sterling Professor of Law Robert C. Post ’77, Chief Judge Robert A. Katzmann ’80. Photo by Matvey Zabbi. Sterling Professor of Law Robert C. Post ’77 delivered the inaugural Thurgood Marshall Lecture at the Second Circuit Court of Appeals on December 12, 2018. Sterling Professor of Law at Yale Law School Robert Post ’77 discusses the appointment of Brett Kavanaugh ’90 to the Supreme Court in Politico. 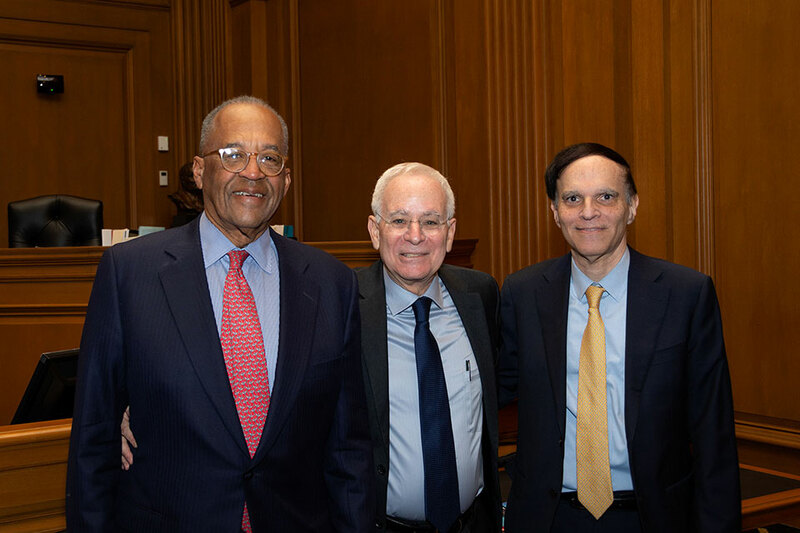 Sterling Professor of Law Robert C. Post ’77 and Professor of Law Abbe R. Gluck ’00 contributed to a discussion on the legacy of Supreme Court Justice Anthony Kennedy. A brief by Sterling Professor of Law Robert C. Post '77 is discussed in an editorial about Janus v. AFSCME, a U.S. Supreme Court case about union agency fees. Robert Post ’77 is a Sterling Professor of Law at Yale Law School. Robert C. Post ’77 is a Sterling Professor of Law at Yale Law School. Sterling Professor of Law Robert Post ’77 is quoted in an article reporting on a panel discussion at the recent Aspen Institute Economic Security Summit. Dean Robert C. Post '77 has been named Sterling Professor of Law, one of the University's highest faculty honors. Dean and Sol & Lillian Goldman Professor of Law Robert Post ’77 is interviewed about his tenure as dean of the law school. Dean and Sol & Lillian Goldman Professor of Law Robert Post ’77, David Cole ’84, Saikrishna Prakash ’93, and Jamal Greene ’05 contributed to an article on the firing of FBI Director James Comey. In the eight years that Dean Robert C. Post ’77 has been at the helm of Yale Law School, he has solidly entrenched the School’s position at the forefront of legal education. Dean and Sol & Lillian Goldman Professor of Law Robert Post ’77 is quoted in an article and video about Senate confirmation hearings for those nominated to the Supreme Court. The American Constitution Society announced new members to its board of advisors, including Dean and Sol & Lillian Goldman Professor of Law Robert Post ’77 and Geoffrey Klineberg ’90. Dean and Sol & Lillian Goldman Professor of Law Robert Post ’77 was interviewed for a feature article about the Supreme Court and First Amendment cases. Sterling Professor Emeritus of Law Owen Fiss is also quoted. 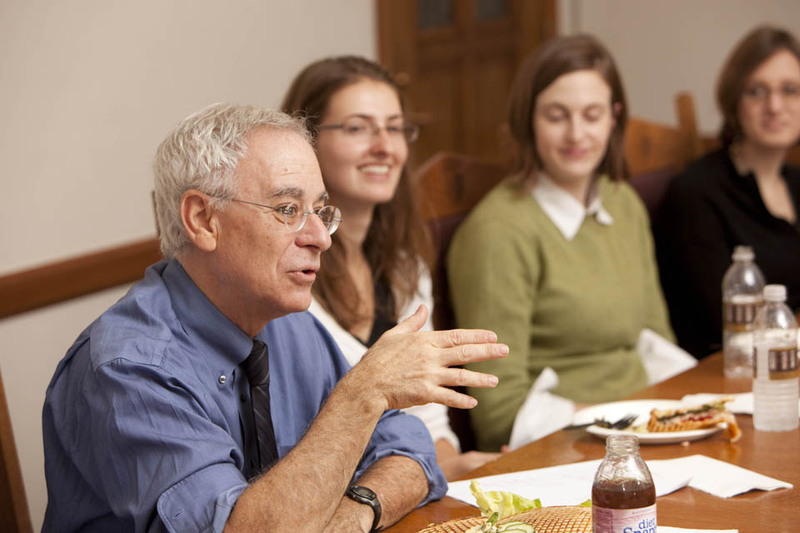 Robert C. Post '77 is the Dean and Sol & Lillian Goldman Professor of Law at Yale Law School. Dean and Sol & Lillian Goldman Professor of Law Robert C. Post '77 is quoted in an article about efforts by Exxon Mobil to fight various state lawsuits over past statements it made about climate change. Dean and Sol & Lillian Goldman Professor of Law Robert C. Post ’77 is quoted about Merrick Garland, nominated to the Supreme Court. A report on a talk given by Associate Supreme Court Justice Stephen Breyer at Yale Law School, with remarks by Dean Robert Post ’77. Dean and Sol & Lillian Goldman Professor of Law Robert C. Post ’77 is quoted in a story about legal challenges to law restricting where and when people may panhandle. 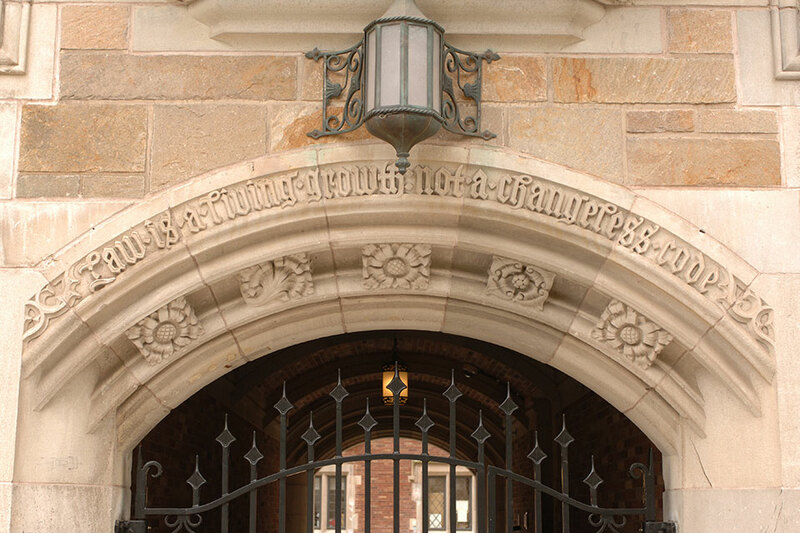 The conference Law, Religion, and Politics: Challenges to Traditional Borders in Global and Comparative Perspectives marks the fourth anniversary of the Debating Law & Religion Series at Yale Law School. Yale Law School’s new students gathered on Wednesday, August 26, for convocation ceremonies in the Levinson Auditorium. Dean and Sol & Lillian Goldman Professor of Law Robert C. Post ’77 is mentioned and Lawrence Lessig ’89 is quoted in an article about legal arguments regarding a proposed City of Berkeley ordinance warning cell phone users of potential health issues. Dean and Sol & Lillian Goldman Professor of Law Robert C. Post ’77 was a guest in a discussion about free speech. Dean and Sol & Lillian Goldman Professor of Law Robert C. Post ’77 and Floyd Abrams ’59 are quoted in an article about the Supreme Court decision on Reed v. Town of Gilbert. Dean and Sol & Lillian Goldman Professor of Law Robert C. Post ’77 is mentioned in an article on a “Right to Know” ordinance that requires local cellphone retailers to advise consumers with information regarding the safe use of their phones. Dean and Sol & Lillian Goldman Professor of Law Robert C. Post ’77 is interviewed about free speech in relation to the Charlie Hebdo attack in Paris. Robert C. Post ’77, Dean and Sol & Lillian Goldman Professor of Law, gave a talk at the Association of American Law School’s (AALS) annual meeting in Washington, D.C., on January 4. Robert C. Post ’77 is Dean and Sol & Lillian Goldman Professor of Law at Yale Law School and Martha Minow is the Morgan and Helen Chu Dean and Professor of Law at Harvard Law School. The Public Health in the Shadow of the First Amendment Conference will take place at Yale Law School on October 17 and 18. Robert C. Post ’77 is Dean and Sol & Lillian Goldman Professor of Law at Yale Law School. In 2010, a sharply divided U.S. Supreme Court overturned a federal prohibition on independent corporate campaign expenditures—and ushered in a controversial new electoral era in which money has flooded political elections. Yale University President Peter Salovey has announced the reappointment of Robert C. Post ’77 as Dean of Yale Law School and Sol and Lillian Goldman Professor of Law, effective July 1, 2014, for a term of three years. Dean Robert C. Post '77 delivers the convocation address to incoming Yale Law students marking the start of the 2013-2014 academic year. Yale Law School's 2013 Commencement Ceremonies were held on May 20, 2013 with addresses by Professor Anne L. Alstott, Dean Robert C. Post, and U.S. Supreme Court Justice Sonia Sotomayor. 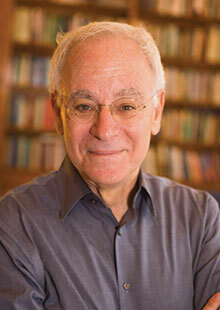 Dean Robert C. Post to deliver Tanner Lectures at Harvard University on May 1, 2013 through May 3, 2013. In his convocation address on August 27, Dean Robert Post ’77 welcomed the 203 members of the Yale Law School J.D. Class of 2015. Dean Robert Post’s recent lecture at Université de Paris-Panthéon-Assas was the first co-hosted event by Yale and Panthéon–Assas under the terms of their new Agreement for Collaborative Activities. Yale Law School Dean Robert Post ’77 will deliver a lecture in Paris on Constitutional Protections for Academic Freedom. 251 degree candidates were honored at Yale Law School’s Commencement ceremonies on May 21, 2012. In his convocation address on August 31, Dean Robert Post ’77 welcomed the 205 members of the Yale Law School J.D. Class of 2014. 229 degree candidates were honored at Yale Law School Commencement ceremonies on May 23. 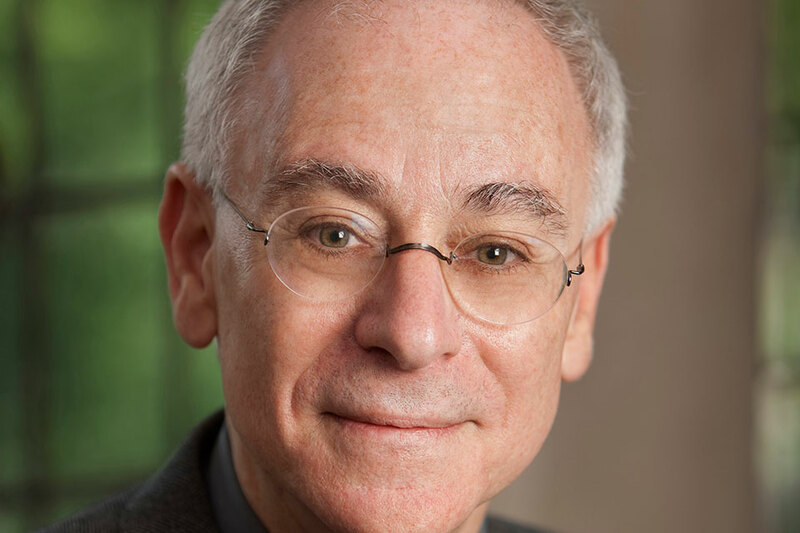 Robert C. Post ’77, Dean of Yale Law School, has been elected to the American Philosophical Society. Leading military appellate court judges from around the world will take part in a Global Military Appellate Seminar April 1 and 2 at Yale Law School. Dean Robert Post ’77 welcomed the 199th class of new J.D. students to Yale Law School on August 25, 2010. 222 degree candidates were honored at Yale Law School Commencement ceremonies on May 24, 2010. Nearly 100 lawyers and legal scholars from North and South America gathered in Asunción, Paraguay, this past June for the 2009 SELA meeting. Robert C. Post ’77 has been named Dean and Sol & Lillian Goldman Professor of Law at Yale Law School, effective July 1, 2009.